Our family has always used JVC camcorders and always will. They have always been reliable and updated with the most updated technology! I just became aware today of the newst line of JVC products, the Everio. The Everio is a hard disk camera that offers innovations in video sharing, dual storage memory models and all this is packed into a compact camcorder! The full line of Everio products offers several options for storage size, color and sharing options which will all affect the final price. This is great for those of us who do not need all the bells and whistles! One of the best features I can see useful for my personal use is the continuous shooting feature, where if your first source of storage runs out, it will go to a second storage unit! How cool is that!!!?? Another great feature they have incorporated is a one touch export feature that will allow you to easily upload your videos to YouTube as well as a one touch DVD creation function for easy archiving and sharing. And if you happen to be a true video guru and need all the bells and whistles then you can opt in for their hi-definition version! 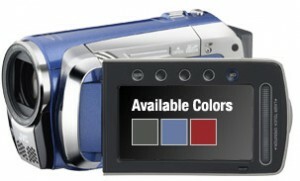 And better yet, for my fashionable readers..the JVC Everio is available in some really great colors! I haven't had the chance to test drive one of these babies yet...but I know a Dad who would love one for Father's Day, so I think I got that covered and hopefully a true review can come soon!